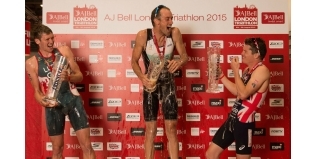 Can an Aussie take the title at the AJ Bell London Triathlon once again? Who's racing on Sunday? The Elite Men will start their Olympic distance race at the ExCeL centre on Sunday at 10:50 am. Here are a few names to watch out for, along with the full Elite start list. A look through the Men's Elite start list for Sunday's AJ Bell London Triathlon shows lots of potential podium finishers, but - in the eyes of this Editor anyway - no clear cut favourite... and that can only be good for some close and exciting racing, because I'm pretty sure there are a lot of names on the list below thinking, "you know what, I think I've got a shot at winning this". Second place last year, Liam Lloyd returns to the Dockland's once again. Liam recently secured a fourth place finish on the ETU European Cup circuit in Altafulla, Spain. That was his best yet and so he should return in good spirits and high hopes. "Last year's event was a great race for me, winning the title of British Standard Distance Senior Elite Champion at London Tri was the highlight of my 2015 season. This year's start list looks very competitive, including some top British senior athletes and I'll be hoping to again be competing at the front of the race. The event itself creates a unique triathlon atmosphere inside the ExCeL Centre and if the weather is anything like it was last year it will be a fantastic weekend of racing for everyone." Having finished second (2014) and third (2015), David Bishop would very much like to complete the podium set this time around. Second recently at the Jenson Button Trust Triathlon, he's been slightly frustrated this year with good performances across all disciplines - just not all on the same day. This weekend would be a great time to get it all right. One Brit who will definitely feel that he can win is Aaron Harris. He was second to Alistair Brownlee at the Blenheim Triathlon in June before finishing 13th at the European Sprint Distance Championships. With a host of top-10 finishes in ITU World Cup events and a sixth place at the Commonwealth Games in Glasgow, Harris is a class act and will rightly see this as an opportunity to make a statement at this high profile event. Mark Buckingham is a man who knows how to win in London, taking the title two years ago. His racing has been restricted by injury this year, but he's recently been training out in St. Moritz with the Brownlee brothers. He will be back - but we understand it is highly likely to be a 'swim-bike' effort only from him, as he is still having rehab on his achilles. Another former winner is London 2012 Olympian Stuart Hayes. His win came eleven years ago in 2005. Now racing on the Ironman 70.3 circuit, he has probably lost count of how many times he has taken part in this race! Last year's race was won by Australian, Peter Kerr - could there be another Aussie winner this time around? If so, chances are it would be Dan Wilson. Dan finished the 2014 season ranked 16th in the Columbia Threadneedle Rankings and with a host of top-10 finishes at the top tier of international racing, he's a real threat. He missed an extended period of racing with injuries, but has recently returned to the World Triathlon Series in Stockholm and Hamburg. Another few weeks on, he'll be hoping to have continued to improve on his run speed to go alongside the swim/bike which saw him come off the bike with the Brownlee's in Sweden. Now more familiar in Ironman circles, Harry Wiltshire will likely be busy this weekend as he is also an ambassador for the title sponsor AJ Bell, including producing the excellent series of video tips that we have been running on the site in recent weeks. Other names to watch include Sam Wade (third in 2014), Iestyn Harrett (fourth last year) and Fergus Roberts (Scottish Duathlon Champion and sixth last week at the Alpe d'Huez Triathlon).